Customer support, customer service, customer experience, customer satisfaction, customer loyalty, customer delight…whatever your business calls it, we all use different types of methodologies for serving the clients who touch our business. With Forrester reporting that 72 percent of businesses have made “improving the customer experience” their top priority, failing to do so in your own business could put you at a competitive disadvantage. Customer service should be the fabric that’s woven throughout the entire customer journey — from the moment your prospect first touches your business — you must deliver extraordinary customer service with every interaction your customer makes. The best brands are built on customer service as it creates customer evangelists for life and provides you with the greatest advantage over competitors. What does customer service mean to you? Having great customer service means having great, loyal customers for life! Providing excellent service to your customers not only benefits your brand, but it can also benefit your bottom line by bringing in more sales. Excellent customer service will make your company stand out. To stay relevant and also make your customers happy, make sure to continuously optimize and update your customer service and retention strategies. Everything from an email marketing campaign to holiday specials can also help with retaining loyal customers and increase trust. 1. Create a culture of trust and everything else will follow. Trust begins at the top, as leaders must create a culture of trust by first trusting others. It is developed through promoting a culture of transparency, listening to employees as well as customers, and giving employees the opportunity to step up to the plate and act autonomously. When trust becomes ingrained in every fiber of your business, a powerful culture will shape your customer experience. 2. Create core company values that inspire. 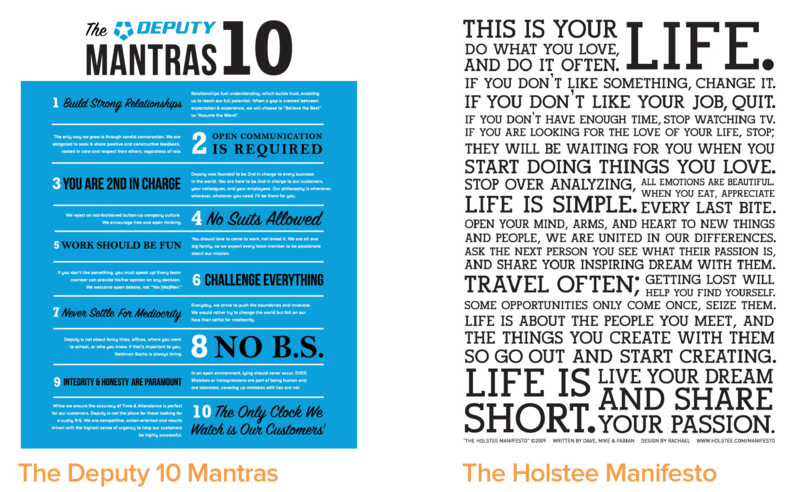 The Deputy Americas office has the “10 Mantras” that shape our culture. They exist to attract and hire the right fit employees and to create the right office culture atmosphere. However, core values shouldn’t just be in the company handbook, they should be a way of life, serving as principles that guide your employees in making the right decisions for your business while working with customers. Your company values must emotionally inspire your employees so they become a part of who they are. Be sure to reference your values often during meetings, presentations, and team building events. Conduct quarterly fireside chats to discuss the values in an unstructured setting. Embody them in the way you operate your business and manage your team. If your core values inspire the way of life you want your business to live, be sure you hire the right people who align themselves with those same values. The best leaders understand that in order to have a great company yielding exceptional customer service, you must first “get the right people on the bus and in the right seat”, as Jim Collins would say. The people you hire should share the same core values and have an inherent passion for the role you’re hiring for. If they love what they do, they will be self-motivated to do it exceptionally well. It costs more to lose an employee than to hire and retain great employees, so it’s worth taking the time to make sure you’re hiring the right person. 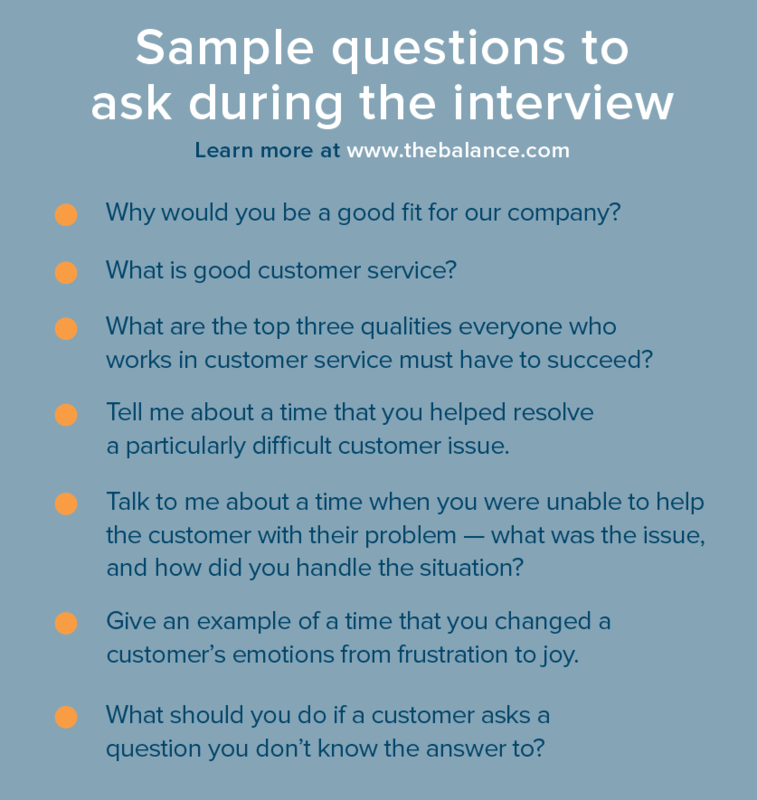 During the interview, it might be wise to suggest hypothetical situations that commonly arise in your company to see how they would deal with it from a customer relations point of view, as well as drawing upon any previous customer service experiences they have had in the past. 4. Engage, educate, and empower your employees. There’s a direct correlation between engaged employees and a company’s profit – in other words, satisfied customers will buy more. R “Ray” Wang Principal Analyst and CEO at Constellation Research tells us that employee engagement can increase cross-sell by 22 percent, drive up self-revenue 38 percent and increase order sizes by 85 percent, so it is well worth putting in the hard yards to get it right. If you need some tips to get started, you can check out our recent article on increasing employee engagement for great business results. Employee engagement is cultivated by empowering your employees to grow in their role, as the younger workforce values training and development as the top benefit most valued by an employer. Provide your employees with constant opportunities to develop their skills, discuss the progress they are making through conducting performance reviews and make certain they have the tools they need to perform their job well. Additionally, making your employees experts in their role, making them knowledgeable about the products, company, and industry, will increase the customer experience tenfold. Offer monthly training with completion tools to confirm they understand what they are servicing. If it’s a customer facing role, using call recording software can also help employees to identify key areas for improvement. Another best practice is to have your employees actually use your product or service so they can deliver superior customer service through the eyes of the customer. When you hire employees you can trust, who are aligned to your values, who are engaged and who are properly educated, they will be empowered to deliver the best customer service possible, making micromanagement a thing of the past. 5. Go beyond solving your customers’ problems. Educating your employees is critical to delivering superior customer service. Once your employees are subject matter experts on your business and industry, your customers can gain from their expertise beyond just having their problems solved. Be sure your team can provide additional tips, best practices, and trends in your industry during customer interactions as this can further build trust and strengthen relationships. Educating your customers on your product or services (e.g. tutorials) will not only help them adopt and utilize all the perks your business has to offer, it also makes your business sticky, improving customer retention and lifetime value. Many companies also send out customer emails that include how-to articles or webinars by industry thought leaders. 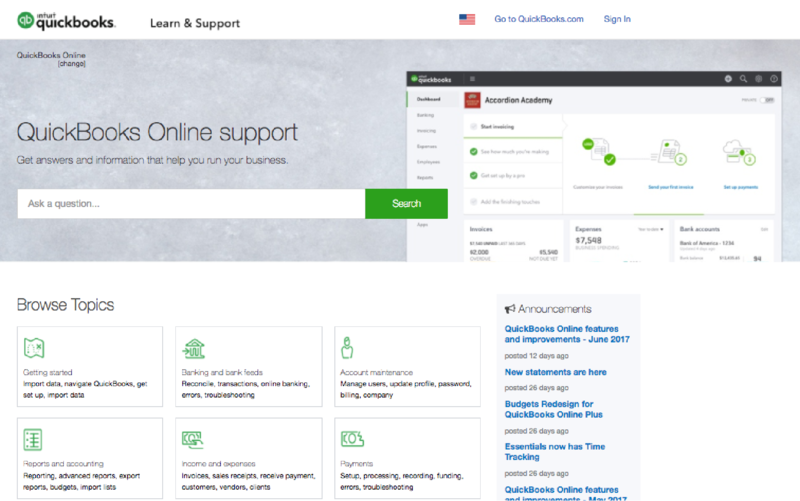 Others offer help centers or university-type sections on their website that house educational resources and highlight recent updates on new products and enhancements. 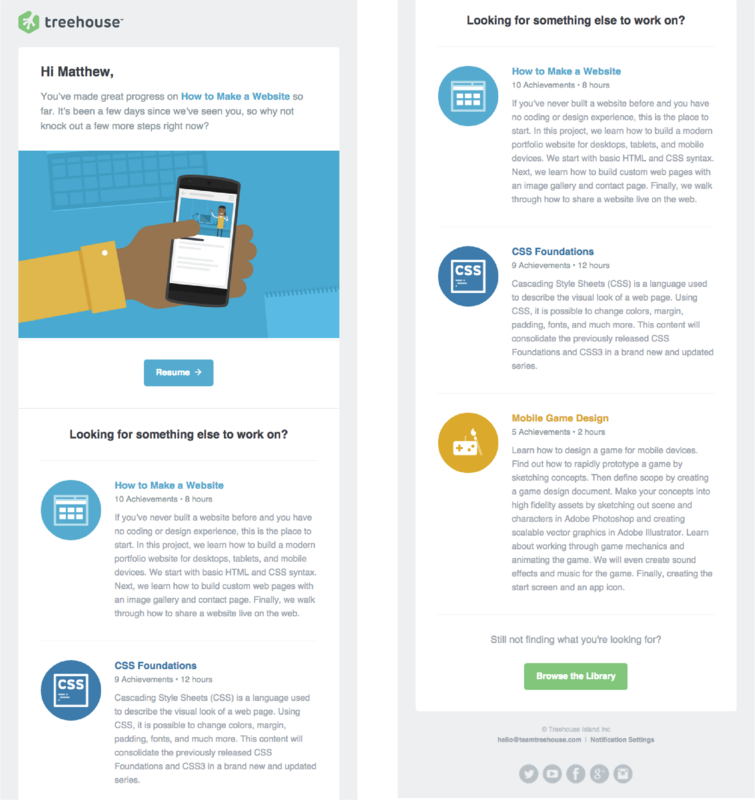 Check out the example below from online technology school, Treehouse. Going beyond educating with upselling and cross-selling tactics is another effective way to educate your customers, however, be cognizant of timing and relevancy to the customer’s needs. Charles Gaudet, a marketing expert and owner of Predictable Profits warns, “effective upselling should always come from a desire to identify and fill needs, rather than just trying to push a product without much concern for how it fits or is perceived”. Customer service employees should pay attention to the context of the customer interaction, first making sure they resolve the original problem and then if the upselling or cross-selling recommendation adds value or improves your customer’s life, it’s worth making the offer. 6. Honesty with the customer is paramount. It might not be surprising to learn that 85 percent of respondents are more likely to support brands they consider to be honest – after all, it makes sense we want to trust the business we are giving our money to. Honesty in customer service means there is no need to cover up errors. It means owning and acknowledging that the problem occurred and following through on what was promised to the customer when it was told it would happen. Regardless of fault, the customer service representative should take personal accountability for the issue (as they are the representative of your business) and be sincere in their apologies and efforts to resolve the issue in a timely manner. If your business understands the fact that everyone makes mistakes — as they are part of being human — your employees will feel comfortable expressing honesty and humility with your customers, resulting in a more genuine customer experience. 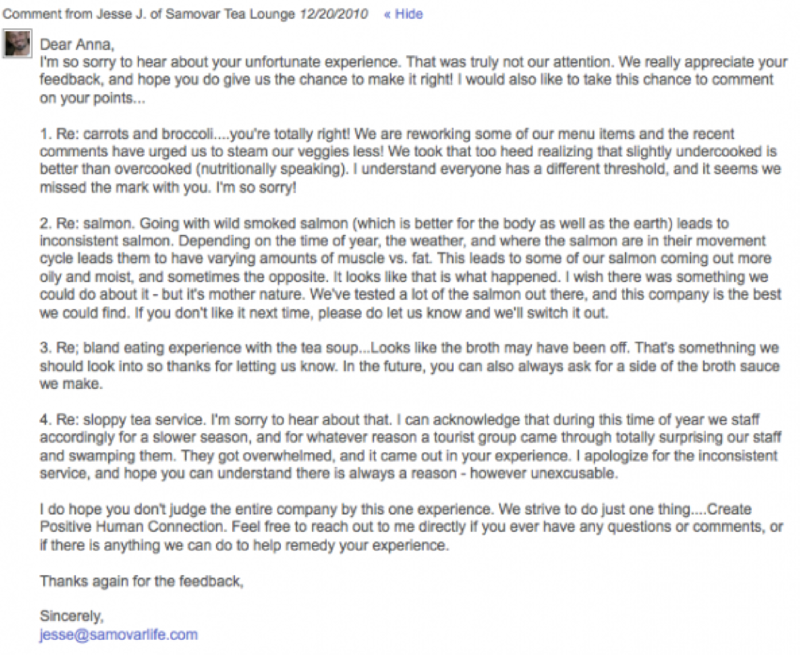 Check out the response below that owner of San Francisco-based Samovar Tea Lounge had for a negative, one-star Yelp review from a customer, which included, among other comments, that “the thoughtless execution threw off the balance of textures and made for a bland eating experience.” Click for a full view of the response. 7. Consistency is always key. In this highly competitive landscape, customers expect consistent, exceptional customer service throughout their entire multi-channel, multi-touch journey. Delivering positive customer interactions consistently across the entire customer journey is greatly influential on the overall customer experience, or as this McKinsey article puts it, “The Three Cs of Customer Satisfaction: Consistency, Consistency, Consistency”. Consistency in service delivery is created by structuring your business with defined and integrated policies, processes, procedures and technologies to ensure every touchpoint is a positive experience throughout your customer journey. Businesses can define the customer journey stages with journey mapping strategies. At the end of every customer touch point, be sure to measure each interaction with customer satisfaction tools such as surveys (tip #12) as it will identify the gaps in your customer journey. The most important point of these customer satisfaction tools, however, is to make sure your business actually does something about it — and quickly. Going back to that specific customer to let them know you resolved the problem will further cultivate trust and loyalty to your business. 8. Humanize the entire experience. Never lose sight of what “being human” can do for your employees, your customers, and your business. Recent research has shown that the majority of U.S. consumers prefer dealing with human beings when solving customer service issues, while over half have actually switched brand allegiances in the past year due to poor customer service. It’s also worth noting that 45 percent of consumers would be willing to pay more if it meant better customer service. Humanizing means making emotional connections with your customers. It’s a by-product of your culture, your values, your leadership team, and your employees all focusing on the understanding that we’re all human, not numbers and transactions. A great example of this human approach is JetBlue. As their core value states, “JetBlue Airways is dedicated to bringing humanity back to air travel. We strive to make every part of your experience as simple and as pleasant as possible.” JetBlue’s human support spans the entire customer journey and across all channels. This includes the traditional phone and email support, but they also provide text updates, a smartphone app, and social media support — all centering around humanizing the customer experience. They respond to social media posts immediately, directing customers to easy to navigate help pages and addressing questions using emojis and GIFs. One JetBlue customer jokingly tweeted that she expected a welcome parade at the gate when she returned home to Boston. 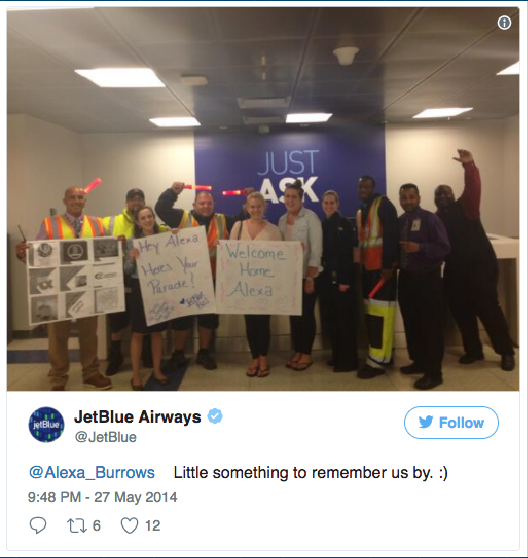 The JetBlue customer support team quickly responded by having a team of JetBlue employees greet her at the gate with signs, smiles, and marching band music. 9. Add a personal touch to your customer service. Personalizing your customer service is another best practice that leading business are using to improve the customer experience. Personalization is about treating the customer as an individual and adding a personal touch to every interaction, making the customer feel important. Zappos provides some excellent examples of personalized customer service, such as saving a best man at a wedding from going barefoot by overnighting him a free pair of shoes and sending a Zappos rep to a rival shoe store to get a specific pair of shoes for a customer when Zappos was out of stock. Nordstrom’s personalization practices are similar. They help their online customers find the right outfit or replace an out of stock coat. In the store, they walk customers over to an item rather than pointing to it and even have been known to search for hours to find a customer’s lost diamond. 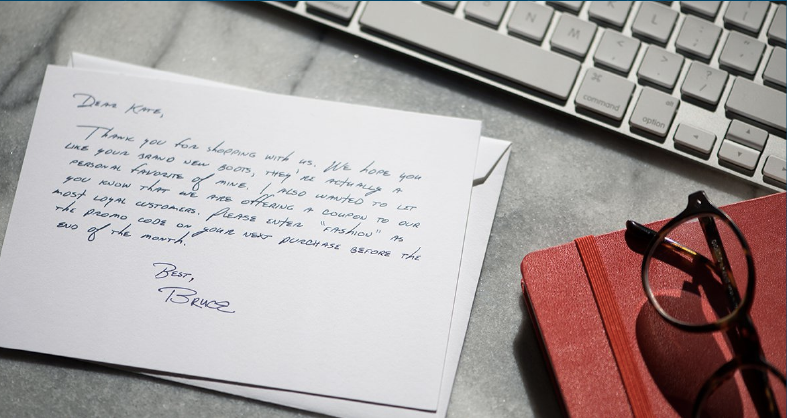 Personalized customer service doesn’t have to be extensive or overly time consuming, it can be as simple as using the customer’s name during in person-interactions, taking notes of your customers’ favorite products and preferences, sending a handwritten or Bond.com personalized card, or personally taking the time to respond to social media comments and messages. 10. Listen first, then take action. As the founder of Walmart, Sam Walton once famously said, “If you don’t listen to your customers, someone else will”. Whether this means introducing a training module on active listening or having your team read a best-selling book on power listening, it is vital that your employees understand the importance of listening and responding to what is actually being said when engaging with a customer. A good way to ensure the customer’s needs are being interpreted correctly is through paraphrasing and repeating the problem back to them, and asking follow up questions to better drill down the problem and find the best solution. Listening is crucial for successful customer service, but it’s more important to turn customer feedback into action. Make sure your business has the right resources and tools (tip #12) in place to resolve the issue in a timely manner so the customer doesn’t feel like it’s falling on deaf ears. 11. 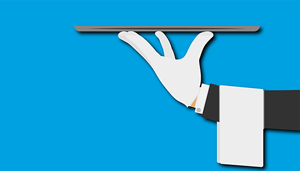 Don’t just meet customer expectations, exceed them. A good rule of thumb from Nelson Boswell when it comes to best practice customer service is “Always give people more than what they expect to get”. The expectations of today’s customers are rising at a significant pace. Increasingly, customers expect a quick, personalized and consistently excellent experience. In fact, according to IBM, up to 76 percent of consumers expect organizations to understand their individual business needs, while 81 percent would like improved response times. Shep Hyken, who literally wrote the eBook on excellent customer service, says that there are three moments of truth that emerge when a customer has a chance to form an impression of your business. The first is the ‘Moment of Misery’ which as its name suggests is a negative impression that results in complaints, problems or issues that are inadequately managed. The second is the ‘Moment of Mediocrity’ which isn’t to say it was a bad experience, but an average one in which your business fails to leave any impression on your customer. Finally, there are the ‘Moments of Magic’, which every business should be striving for, in which the customer has a consistently awesome customer service experience that leads to them recommending your business to others. When your customer service unswervingly excels customer expectation, the ‘Moments of Magic’ will take care of themselves. 12. Leverage technology to power customer experiences. There’s a plenitude of training tactics and courses designed for employees to provide the best customer support that only a human can deliver, but businesses who also integrate customer service technologies into every touch point of the customer journey are the proven customer service leaders. 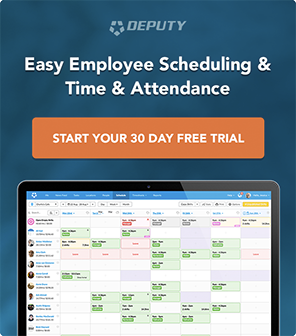 For email and online support, many businesses use ticketing systems and helpdesk software like Desk.com or Salesforce Service Cloud to improve the speed and quality of each customer interaction. When businesses rely on phone customer support and call volume peaks and troughs are hurting the customer experience, call center software can provide a more expedient interaction while assigning the best agent for each customer need. Alternative customer service channels like text, live chat, and social service solutions are growing in adoption for businesses of all sizes. Supporting customers via text/SMS with solutions like Zendesk allows customers to text the business and automatically create support tickets for a quick resolution. Live chat solutions like Intercom, Drift, and LiveChat are quickly becoming a top customer service tool as it provides customers with real-time 24×7 support. A recent survey by Software Advice reported 49 percent of respondents are now preferring to use live chat for online questions. There are even solutions designed to enable customers to switch from a call to a text chat with a customer support rep as “64 percent of consumers with texting capabilities would prefer to use texting over voice as a customer service channel”. Social media customer service tools like and LiveAgent and Sparkcentral can streamline and personalize your customer experience, letting your team support your customers across Twitter, Facebook, and Instagram in real time. And most important, to ensure consistency with every interaction, measuring service quality with customer satisfaction tools like customer feedback software or Net Promoter Score surveys like Delighted can provide continuous improvement for a seamless customer journey. 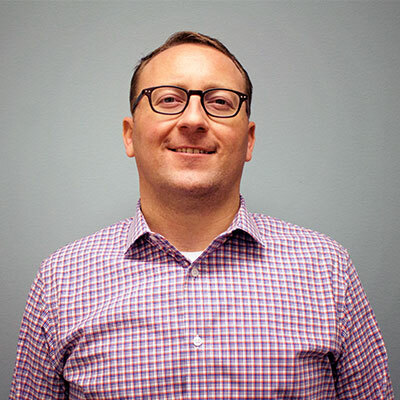 John Cozad is the VP of Operations, North America and has 17+ years of experience developing and implementing operational standards, processes, reporting and structuring top businesses into one cohesive operational model.